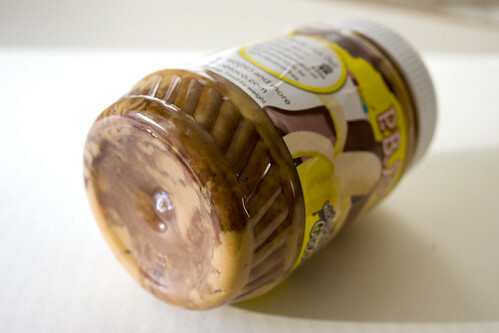 I’ve already raved about P.B.Loco’s Peanut Butter with Raspberry White Chocolate, but it’s now time to put the spotlight on it’s fellow spread, the Cocoa Banana. Unfortunately I didn’t get to do anything fun with this peanut butter like bake cookies with it or drizzle it over ice cream – I was too busy eating it straight out of the jar. I did manage to dip some pretzels in it and try it on a sliced banana and it’s delicious both ways. I think the speed at which I went through the jar speaks well for how tasty it was. Though if I had to pick between the two, I might actually go with the Raspberry White Chocolate. However I think that’s just due to a personal preference of raspberry over banana; they are both great. For another snack idea, I also think that this spread would taste great on a graham cracker with some marshmallows. Of course I think just about anything would taste great on a graham cracker. Not anchovies though. Ick – what’s wrong with you? 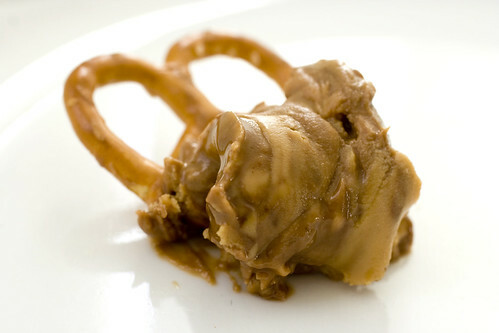 Check out the chocolate and peanut butter swirls on the bottom of the jar. Yum! If you want to dress up your peanut butter collection, pick up a tasty jar of P.B.Loco’s Premium Peanut Butter with Cocoa Banana! FYI Like the Raspberry White Chocolate, this peanut butter is also all natural, gluten free, doesn’t have hydrogenated oil, has zero grams of trans fats and is cholesterol free. YUM! I need to get me some of that!